– Red lights, roadside dirty diapers, shattered glass: Powerless to ruin a ride, but a nuisance just the same. This is where I classify certain runners — those willingly deaf to the world thanks to the ipods they wear. Their music: Too loud to hear you approach, no matter the warning you try to provide. Their music: A necessity to them since it’s the only salve available against the Sisyphean tedium at the heart of their dreadful sport. “Share the road” entails situational awareness of everything present yet theirs is a solitary universe. – You’ve put the bike on the roof rack. How long must the drive be to get you to stow your bottles inside the car? – Just in case you were worried that NBC’s Olympic coverage cornered the world market on ill-conceived sports analysis, the Boulder Report surprisingly & dismayingly met the NBC standard with recent comments about the Tour of California. It’s cheap shot on Team Sky is a display of (willful?) ignorance far below its usual smarts & savoir faire. If there was ever a race for Team Sky to skip, the Tour of California is it. Despite the massive media reach of Sky News, their involvement with US media markets is mostly nil. Secondly, the team has no US riders to elicit cycling-media interest. Thirdly, between March and August, Europe is the exclusive home to the major leagues and races outside that nucleus are logistically painful and their lack of pack-wide talent makes them slow & squirrely. Calendar positioning is paramount on the ProTour. Consider the Tour Down Under. The entirety of its prestige is based on its January time slot. Shift it to March and it dies in an instant (painlessly, with no remains to be found.) By moving the Tour of California to May, its global relevance gets murdered. Just because some stars are there, it doesn’t make the race consequential. Is Lance’s appearance fee 6 figures or 7? Just look at the post-Tour (de France) criterium circuit. It’s loaded with paid-off stars and nobody outside a 10-mile radius knows, cares, or will remember them. Move the Tour of California back to February. Make it a logical stop for the ProTour elite on their way back from Australia. Don’t let it go where it’ll be in 2010: Provincial. Unnoticed. Some might ask: Doesn’t the fact that it’s now owned (at least a portion) by the ASO impart prestige and consequence? The answer is three words long: Tour du Faso. So long as the Tour of California is in May, we’ll have a new name for it around here: The American Tour du Faso. To think of it as anything else is to ignore the powerful century-old tradition of springtime racing in Europe. Delusion, hubris, good intentions, ignorance — whichever of these shifted the race from February to May — won’t trump the heritage of our beautiful sport. – Speaking of the American Tour du Faso, a story came out this week where Dave Z stated that winning it is a central focus of his 2010 season. I read the story on the same day I happened to be pounding away on the trainer watching his breakthrough ride as a PRO at the 2004 Tour of Spain. – A conclusion re: Style On The Bike, two elements of which I’ve mentioned previously (brown shoes, a nice watch.) The final step to true style is beautiful glasses. Fausto Coppi shows just how right it can be. I remember a latter-day example from the 80’s. It was on the cover of Winning Magazine and I’m pretty sure it was Matt Eaton (?) of Team Alfa-Romeo. No helmet to muss up his lovely hair, set off just right by his Ray Ban Aviators. 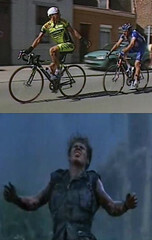 By comparison, today’s pro peloton is just one step away from looking like 200 Sleestaks. – Paris-Roubaix 2003: Romans Vainsteins as Jesus. Really it’s Vainsteins as Elias in “Platoon”. The parallels are manifold: In green. Funny headwear. Bloody & outnumbered and the script, early on, makes his doom apparent with crucifixion-like gestures at the very end. The Film Studies majors amongst us make it clear Elias has, thematically speaking, Jesus overtones. Vainsteins as Elias. Elias as Jesus. You get the idea. Servais Knaven of Quick Step as wheelsucking Judas. Vainsteins struck towards redemptive victory once and again in the ’03 Paris-Roubaix (keep in mind his previous 3rd places in Roubaix, at the Ronde, in Milan-San Remo, and in San Sebastian), only to splinter the field to the point that Pieri, Eki, and van Petegem could inch away without him. He got 6th that day. It was, IIRC, his last consequential result. Out of nowhere he became World Champion in 2000. Out of nowhere his fitness vanished and he retired in 2004. Bidding adieu at Roubaix: That’s a sign of class, and it’s one of the million stories of the ’03 Roubaix.